O.S. & Y. (Outside Screw & Yoke) External spindle thread with a bracket. Rising spindle and steering wheel With flat sealing surfaces. Pressure-loaded packing box with the cone in fully open position. From DN125-PN40 and DN200-PN16 with opposite direction of flow Pressure relieving cone from DN125-PN40 and from DN200-PN16. Valves are fitted with handwheel. Housing made of steel castings GP240GH + N (GS-C25N) (1.0619) Stainless steel sealing surfaces. Medium -10 ° C up to + 400 ° C.
Working temperature and working pressure ratio according to DIN EN 1092. As shut-off valve for non-aggressive liquids, gases, water, hot water, condensate, steam and petroleum products. For industries, power plants, ships, etc. 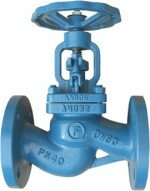 Valves for regulation can be delivered with a control key. DIN EN 1092 standard determines the permissible working pressure in relation to temperature.